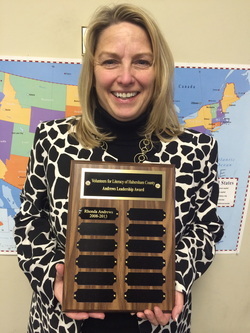 The Andrews Leadership Award is presented annually to a Volunteers for Literacy of Habersham County board member who exemplifies leadership through their non-profit community involvement. The recipient of this award has helped Volunteers for Literacy envision the future and identify paths to success for carrying out that vision. This member has exhibited integrity, collaboration and commitment in fulfilling VFL's mission to "empower people through literacy so they can lead more productive and fulfilling lives."